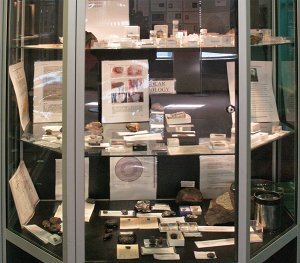 Our Chairman Jim Mehta writes: In celebration of The International Year of Astronomy 2009 to record the 400 years that have elapsed since Galileo invented the telescope, OAS staged a display at Bromley Central Library. There were eighteen displays in total, each one illustrating and explaining a subject area in Astronomy. 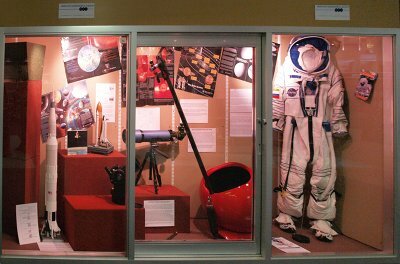 Many members contributed to the display materials, which included telescopes, astro-photographs, meteorites, books, a spacesuit costume, and models of spacecraft from Apollo to the Space Shuttle. The exhibition ran every day for two weeks and was well attended. On the middle Saturday members of the Society were on hand with telescopes to talk to members of the public. Unfortunately the weather was bad so no Solar observing was possible but a very successful day was still had by all. The comments in the visitors book show how well the display was received, and there are more photographs of the displays in the Events section of our gallery.